A heating system has two basic parts: a heat source and a means of distributing it. The first part uses any of a number of fuels and appliances to produce heat. These fuels include oil, natural gas, propane, wood, electric resistance, and even electric assist to heat pumps. The appliances range from boilers, upflow & downflow furnaces, wood stoves, wood furnaces, electric baseboard heaters, or various types of heat pumps. Contact us today to schedule a Free Estimate for a geothermal heat pump, radiant heating or any of our other heating system installation solutions in Rochester, Ithaca, Syracuse, Webster, Auburn, Fairport, Pittsford, Cortland, Canandaigua and throughout The Finger Lakes! Systems move heat to the rooms in which you need it in various ways. The transport medium is typically air or water, or a combination of the two. Forced-air systems use blowers to move heated air through ducts. Hydronic systems move heated water through pipes or tubing to baseboard radiators (fin or cast-iron) or to radiant floors (or ceilings). Hydro-air systems move heat through both pipes (tubing) and ducts. Convective distribution relies on the natural movement of air. For example, a wood stove placed in a basement, can heat an entire house. Together, the heat source and the heat distribution method define the heating system. For example, you can have a gas-, oil- or wood-fired forced-air heating system – depending upon whether the appliance is a gas- or oil-fired furnace or a wood-fired furnace. Similarly, you can have a gas- or oil-fired hydronic radiant or baseboard system depending upon the fuel you’re using and how you’re distributing the heat. There are a variety of combinations. A furnace burns fossil fuel, such as oil or gas. A heat exchanger, inside the furnace, transfers heat to air. A blower moves the heated air through supply ducts to the rooms of your home. Return ducts deliver room air back to the furnace so it can be reheated and redistributed. Forced-air heating is affordable and its ductwork can be used for cool air distribution in summer. A gas- or oil-fired boiler heats water that is pumped through a heat exchanger or coil mounted in your ductwork. As air passes through the coil, it picks up heat before being distributed throughout the home. The boiler in a hydro-air system often does double duty, heating water for washing as well as for heating. This eliminates the need for a separate water heater. A boiler heats water which is then pumped to baseboards or other types of radiators. This type of heating system requires no ductwork, which is both good (no bulky or leaky ducts) and bad (no distribution for central air conditioning). Heat pumps run on electricity but are more efficient than conventional electric heaters. That’s because they can draw heat from the air, even when it’s fairly cold outside. Think of them as a central air conditioner that can run in reverse, supplying hot air in the winter and cool air in the summer. If you've ever waved your hand over your AC unit outside on a hot day, you probably noticed the outdoor unit was blowing hot air. During cold weather, this cycle can be reversed to move this heat into the house. Air-source heat pumps are viable only in moderate climates. For more information, click here. A GSHP works like its cousin, the air source heat pump, with one major distinction: It relies on the earth's ground energy to either dump its heat (summer) or pick it up (winter). Because the earth's temperature remains about the same (55-65 degrees F) 6-12 ft. below the surface, this type of heat pump performs efficiently in all climates. For more information, click here. These systems supply hot water for space heating and also for bathing and washing. Typically compact and very energy efficient, they are popular in Europe where energy costs are very high, and space is at a premium. Combi systems burn fossil fuel, and usually can supply virtually any form of hydronic heating application. 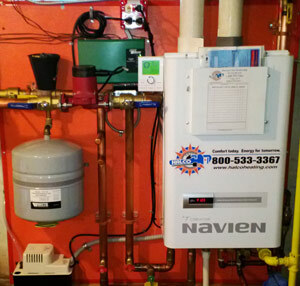 This system uses a boiler to supply warm water to a network of tubes or pipes installed under your floor. (It can also be installed above your ceiling in situations where it will circulate cold water for summertime cooling.) The flooring material is warmed and radiates heat to people and objects in the room. It does not heat air directly, so it is considered the most comfortable heating system. Because it can operate at lower temperatures, it’s also one of the most energy efficient. By combining an air source heat pump with a fossil fuel furnace, hybrid systems give you the flexibility to use the most cost effective fuel at any given outside temperature. In addition, you get built-in redundancy so that if one system isn't working correctly, the other can take over. Controls are automated so there's nothing for you to do once you have programmed the thermostat. We are The Finger Lakes' home heating specialists and expert HVAC contractors, providing furnace repair and replacement and energy-efficient heating installation in and around Ithaca, Rochester, Syracuse, Geneva, Penfield, Hilton, Spencerport, Brockport and nearby. Contact us to schedule a heating repair estimate today. Our HVAC technicians have experience installing renewable energy heating solutions like radiant heating, solar heating and geothermal heat pumps. We also provide service for HVAC systems in order to make them more efficient.